Some Christians bless their home on Epiphany each year. With chalk, they write all inscription on the inside lintel above the front door. The series of numbers, letters and crosses changes only slightly from year to year. For example, at the start of the year 2016, the line will read as follows: 20+C+M+B+16. The four digits designating the new year appear at the beginning and end of the line. In 2016, for example, the last number changes to a 16. The last number changes each new year. Because Epiphany comes so near the beginning of the new year, the numbers represent an annual renewal of God's blessing. The letters have two meanings. 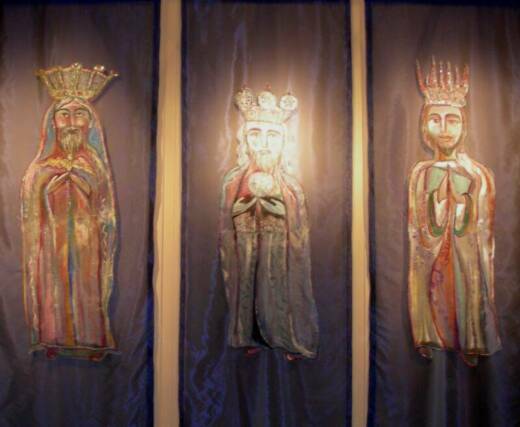 They are the initials of the traditional names of the magi: Caspar, Melchior and Balthasar. They also abbreviate the Latin words "Christus mansionem benedicat." "May Christ bless the house." The letters recall the day on which the inscription is made, as well as the purpose of blessing. The crosses represent Christ, whom we invoke, and the saintliness of the magi. The inscription is made above the front door, so that all who enter and depart this year may enjoy God's blessing. The month of January still bears the name of the Roman god Janus, tile doorkeeper of heaven and patron of the beginning and end of things. This blessing adds a Christian dimension to the traditional observance of the first month. The inscription is made of chalk, a product of clay, which recalls the human nature taken by God's eternal word in this holy season. If you want to bless your home this Epiphany, pray the blessing prayer below, then the Lord's prayer, then write the inscription for this year above your front door with chalk. During these days of the Christmas season, we keep this feast of Epiphany, celebrating the manifestation of Christ to the Magi, to John in the River Jordan, and to the disciples at the wedding at Cana. Today Christ is manifest to us. Today this home is a holy place. Lord our God, bless this household. May we be blessed with health, goodness of heart, gentleness and the keeping of your law. We give thanks to you, Father, Son, and Holy Spirit, now and forever Amen. Christus manisioem benedicat, May Christ bless this house.